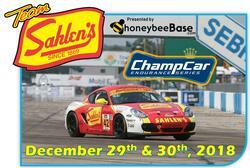 On December 29th, Team Sahlen returns to Sebring International Raceway for the 1st time since 2015. This event 3 years ago was the IMSA Continental Tire Challenge Series. In this race, Team Sahlen secured a solid 5th and 6th in the ST Class with their Porsche Caymans. On this end of 2018 event, Team Sahlen will be racing with ChampCar Endurance Series for their Dual 7 hour endures. Friday will be unloading and registration day for ChampCar teams and racers. Both Saturday and Sunday’s 7 Hour Endurance races will start at 9 am with the checkered flag flying at 4 pm. Log into ChampCar.org for live race timing and scoring.